Shimane Zeus Bitter is a 4.5% English bitter from Shimane Beer Company that is part of their limited edition range of beers. 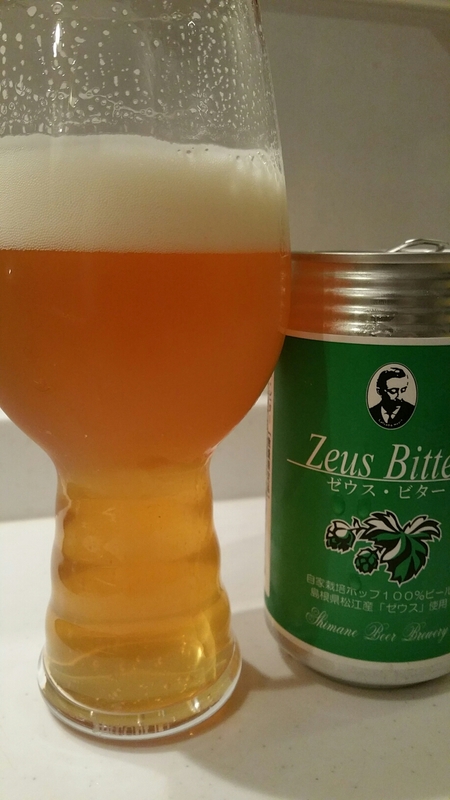 Shimane Beer Company went pretty far to use Zeus hops as the ones they used were 100% home grown. Zeus hops are more commonly found as part of the trifecta of CTZ, which stands for Columbus, Tomahawk, and the aforementioned Zeus. Shimane Zeus Bitter can be found in cans and bottles though it’s probably on draft somewhere, we haven’t come across it. It was first released back in 2011. Zeus hops – first time for me to try them on their own. And I like them. It’s always hard to review beers that have little to no information about them and Shimane Zeus Bitter was no exception. Besides a couple of Japanese articles, not even the Shimane Beer Company’s online store had much listed about it. I trundled off to find information about it in Japanese and came across one page but all it had was pictures! Anyway, griping and whining aside, Shimane Zeus Bitter poured out a light golden colour with a fair amount of fluffy white head that lingered right on through until the end. It had a subtle sweetness to it but the citrus punch from the Zeus hops was the most prominent aroma from the beer. It brought a nice floral aroma too which wasn’t offensive nor overpowering aroma. If you’re looking for something with a high ABV though you are out of luck. At 4.5%, Shimane Zeus Bitter is should be classed as a session beer according to some online articles but growing up in the UK, the majority of beers are 4.5%. The body was crisp and refreshing which provided a good balance to the sweetness and citrus flavours. There was some bitterness in the aftertaste but nothing like an American IPA. Shimane Zeus Bitter is a tasty little beer that impressed me with the change of hops. A nice find. But ENGLISH Bitter with American fruity, citrus, zesty hops?????? No. American bitter, or pale ale, perhaps. It’s like me making a german weizen that was 84IBUS with chinook hops. It is no longer a German weizen. ???? Which is it? What is the beer meant to be? It can’t be seen as both an English bitter and an American IPA. I’d agree with your assumption that it should be a an American session ale. 4.5% would be best or special bitter category back home but those hops arent in the background (… which provided a good balance to the sweetness and citrus flavours) but very much in the forefront of the flavors and so not a British or English style bitter ale. American, so like i mentioned earlier, possibly best to describe it as an american session pale ale or an american styled best bitter but I think most people in Japan still have little clue over beer styles so probably best to call it a pale ale. Well people often assume bitterness with an American IPA so wanted to make it clear that while it was bitter, it wasn’t as bitter as an American IPA. An American session ale would be a the best description but the brewery designated it as an English bitter in terms of style.